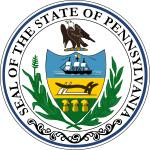 Pennsylvania elected its members October 8, 1816. Joseph Hopkinson Federalist 1814 Incumbent re-elected. Thomas Smith Federalist 1814 Incumbent retired. Plural district with 2 seats William Darlington Democratic-Republican 1814 Incumbent lost-relection. John Hahn Democratic-Republican 1814 Incumbent lost-relection. James M. Wallace Democratic-Republican 1815 (Special) Incumbent re-elected. Pennsylvania 4 Hugh Glasgow Democratic-Republican 1812 Incumbent retired. William Crawford Democratic-Republican 1808 Incumbent lost-relection. John Ross Democratic-Republican 1814 Incumbent re-elected. Pennsylvania 8 William Piper Democratic-Republican 1810 Incumbent retired. Pennsylvania 9 Thomas Burnside Democratic-Republican 1815 (Special) Incumbent resigned in April 1816 to accept judicial appointment. New member elected October 8, 1816. Jared Irwin Democratic-Republican 1812 Incumbent retired. Successor resigned before Congress started, leading to a special election. Pennsylvania 11 William Findley Democratic-Republican 1802 Incumbent retired. Pennsylvania 12 Aaron Lyle Democratic-Republican 1808 Incumbent retired. Pennsylvania 13 Isaac Griffin Democratic-Republican 1813 (Special) Incumbent retired. Pennsylvania 14 John Woods Federalist 1814 Incumbent retired. Pennsylvania 15 Thomas Wilson Democratic-Republican 1813 (Special) Incumbent retired. ^ Only candidates with at least 1% of the vote listed. ^ Cox, Harold (January 31, 2007). "Pennsylvania Election Statistics: 1682-2006". The Wilkes University Election Statistics Project. Wilkes University. This page was last edited on 29 December 2018, at 13:45 (UTC).